Terpsichore's orbit follows an eccentric course that carries it across the Asteroid Belt, from its inner to its outer edge. 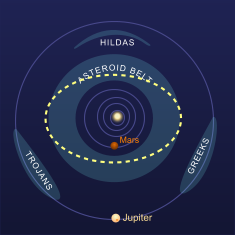 An asteroid of the Solar System's main Asteroid Belt, between the orbits of Mars and Jupiter. Terpischore (pronounced 'terp-SIK-or-ee') is named for one of the nine muses in Greek mythology, specifically the muse of dance. Each of these nine muses has given their names to a different asteroid of the main Belt. Terpsichore itself is dense with carbon compounds, giving it a dark surface that reflects little sunlight into space. Terpsichore is not quite spherical in shape, and has an irregular diameter that varies around an average value of some 120 km. It rotates on its axis in a period of a little under eleven hours. This asteroid has a somewhat eccentric orbit that carries it on a tour back anf forth through the Asteroid Belt. Over a period of four years and ten months, this eccentric orbit will see it reach the outer edge of the Asteroid Belt, and then travel back inward across the Belt, almost reaching its inner edge before beginning its outward journey once again.